Baby Gem wasn't expected to survive after she was born at 29 weeks, weighing just 0,7 kg. She was so small, she could fit into a Barbie doll's clothes. Baby Gem Monks wasn't expected to survive after she was born by emergency C section at 29 weeks in June 2016, weighing just 0,7 kg. But now the adorable infant is one -- and she celebrated her first birthday by recreating a photoshoot to show her miraculous transformation. Her mom Kheri (33), from Baton Rouge, Louisiana in the US, had been diagnosed with HELLP syndrome - a life-threatening pregnancy complication. It's a group of symptoms that occur in pregnant women who have hemolysis (the breakdown of red blood cells), elevated liver enzymes and low platelet count. The newborn spent 78 days in the neonatal intensive care unit and had multiple surgeries to save her life. The day #Gem graduated from the #NICU!!! I was a little excited...Gem was too!!! #shesdabbing * * #MarchForBabies #WhyIWalk #NICUGRAD #GemElleMonks #GemStrong #WalkForGem #DONATE #DONATE #DONATE Click the link in my bio. #ItsNotTooLateToDonate #HelpUsReach2500 #marchofdimes #unitedinmotherhood #nicumom ??? 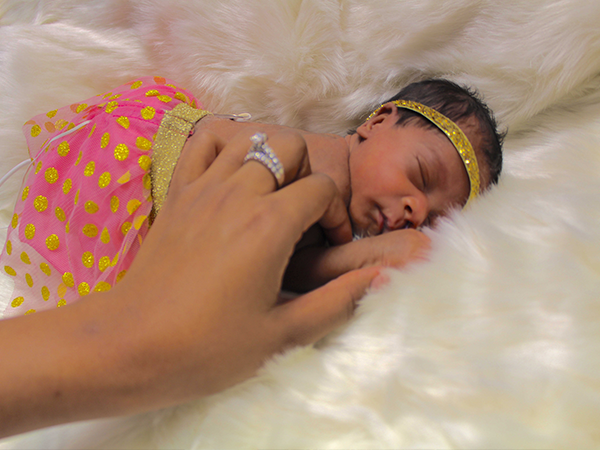 Despite being unable to leave the hospital, Kheri was determined to have a photoshoot with Gem. The nurses allowed her only five minutes to take snaps of her daughter, dressed in clothes from Toys R Us when she was one month old. "I took my camera and I let them know I just wanted to take pictures of her," full-time mom Kheri recalls. "I had to put on Barbie doll clothes on her and [use] a toy white rug. "I had five minutes to snap the photos and she didn't drop her heart – she stayed well. It was amazing to be able to celebrate her first birthday. She's had a rough start but she's a fighter." Now, a year later, after reaching her milestone birthday, the tot and her family recreated the shoot - and this time the littl girl weighed a healthy 6,8 kg. Kheri's pregnancy was going smoothly until one day, while watching TV at home, she began experiencing intense pain. "I couldn't even scream, I had to bang on the door to get my husband's attention. He rushed in and I had ripped off all my clothes, I was vomiting, I was scared. "I tried to lay down but everything hurt." Her husband Justin Monks, drove them to the hospital and where Kheri was diagnosed she had HELLP Syndrom, which affects just five to eight percent of women world wide. When they arrived at the hospital, they told her husband to call the family because they weren't sure if Gem and Kheri were going to survive. "I had planned this picture perfect pregnancy. I was blaming myself," Kheri says. "I felt like everything was my fault, I felt like I was was not motherly, or womanly enough. "I only agreed to have the emergency cesarean because Gem's heart rate was quickly dropping and the nurses told me we'd both die if I didn't do it." Gem was rushed to NUCI and when she was eight days old, Kheri was finally able to hold her baby daughter. "I was with her every day. It was so detrimental not being able to hold her and when I was discharged, leaving the hospital took a toll on me. I was so scared of her dying. I'd never seen a premature baby, only on TV." Baby Gem was in the NICU for 78 days and underwent 3 surgeries but last August she was able to come home. "Everything has been smooth, I do have a few oxygen tanks just in case, but she hasn't needed them. She's taken physical therapy twice a month, she's not walking yet, she's pulling herself. "Now she's starting to clapping her hands. It took her a while, but she's catching up. She's still small but she's a busy body."